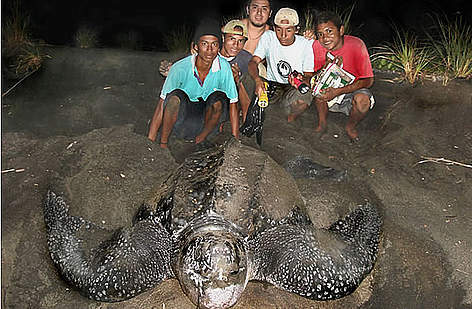 “Baula boys” with leatherback turtle in Junquillal beach, Costa Rica. The ultimate aim is that coastal communities value marine turtles more alive than dead and that they benefit from their conservation. From 2005 to 2010, WWF developed the Project for Conservation of the Pacific Leatherback and other Marine Turtles at Junquillal Beach (CBP), to save the critically endangered Pacific leatherback turtle in Junquillal Beach, Guanacaste, Costa Rica. This community-based conservation project, leaded by Dr. Gabriel Francia, is pioneering the work on mitigation and adaptation of climate change impacts to the nesting sites and the local people. This is no longer a WWF project but it is still running independently.